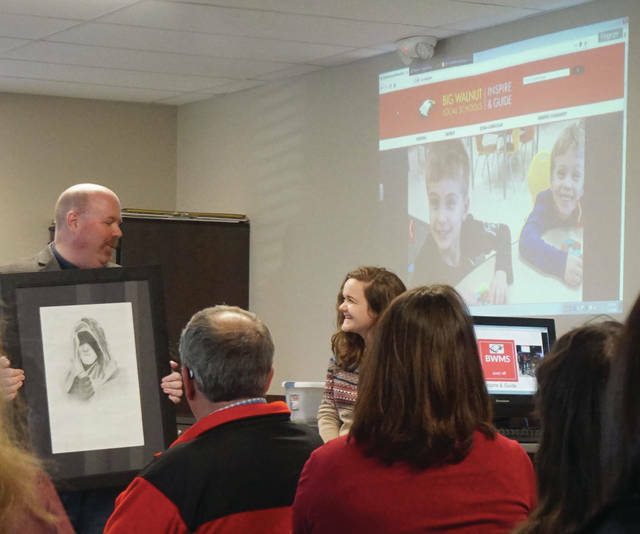 Brad Schneider, a member of the Big Walnut Board of Education, congratulates Alexa DeGenova for being named Big Walnut Middle School Art Student of the Month during a board meeting held March 15 in Sunbury. Should you ever hear, see or suspect something, you may make an anonymous report by calling or texting the Safer Schools Ohio hotline at 1-844-SAFEROH (723-3764). After a recent lockdown incident, the Big Walnut Local Board of Education passed a resolution supporting “School Safety and Reducing Violence in Schools” at its meeting March 15 in Sunbury. The vote was 5-1, with Doug Crowl casting the lone no vote. The resolution “implores the President of the United States, the Governor of the State of Ohio, the United States Congress, and the Ohio General Assembly to prioritize the protection of students and school employees” with funding for mental health services, increased safety measures, and more training. During the board member comment portion of the meeting, Crowl said he was “heartened that there was very minimal disruption” to Big Walnut classes on March 14, when there was a 17-minute walkout by some students across the country to honor the victims of a school shooting in Parkland, Florida, one month after the tragedy. Student board representative Jacob Troyer said Student Council discussed the walkout but agreed not to politicize the event. Instead, they have decided to hold a “Unity Week” following Spring Break and a Law Enforcement Appreciation Day on May 3 that includes delivering pictures to the families of the slain Westerville police officers. On March 8, there was a lockdown incident at Big Walnut High School, where students stayed in their classrooms until the all clear was given. According to district correspondence, there was “a verbal threat made by a student in the building.” Later that morning, “a statement was found on the wall of a middle school bathroom.” Investigations determined that there was no credibility to either threat. On March 9, there was a safety drill conducted at Hylen Souders Elementary. In an email to parents, Principal Matt Cox said Souders has monthly safety drills that have been previously scheduled, and this was not in response to the lockdown. “Safety continues to be our top priority,” Cox wrote.